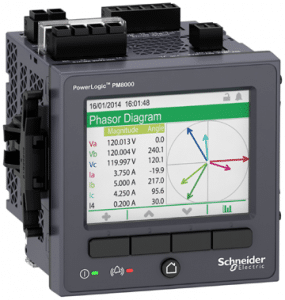 The PowerLogic PM8000 series of compact power meters that will help you ensure the reliability and efficiency of your power-critical facility. PM8000 series meter is a highly accurate, extremely reliable power and energy meter with unmatched flexibility and usability. The meter combines accurate 3-phase energy and power measurements with data logging, power quality analysis, alarming and I/O capabilities not typically available in such a compact meter. The PM8000 series meters are compliant with stringent international standards that guarantee their metering accuracy and power quality measurements. Ideal for industrial and critical power installations that are responsible for maintaining the operation and profitability of a facility. With the PowerLogic PM8000 series meter, you have the means to monitor and manage power quality (PQ) compliance and analyses that was once reserved for more advanced meters. The PM8000 series meters are compliant with the following power quality compliance-related standards: IEC 61000-4-30 class S, IEC 62586, EN 50160 and IEEE 519. Thanks to its IONTM technology platform and modular I/O extension modules, the PowerLogic PM8000 series meters can adapt over time to meet your ever changing application needs.